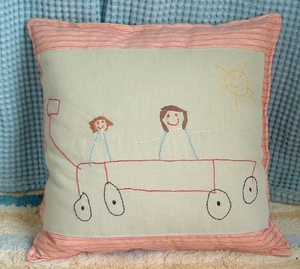 Pillows were the weekend crafting theme around here. 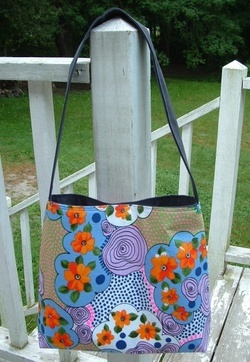 And have I mentioned how crafting is totally and completely my therapy? So yeah, I was busy crafting this weekend! 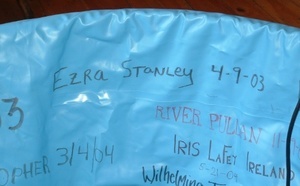 As a result, here's Ezra's new "Dream Pillow". 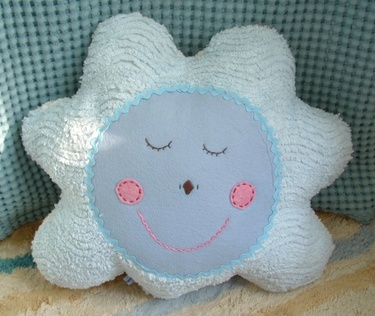 Chenille was 50% off at JoAnn's, so I couldn't resist buying some for baby projects. 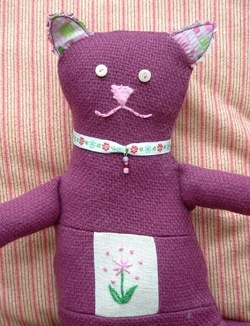 I used plant dyed wool felt for the face, and embroidered the details. There might be more of these in my future--besides the one that big brother has requested, I was thinking they'd make great baby gifts. 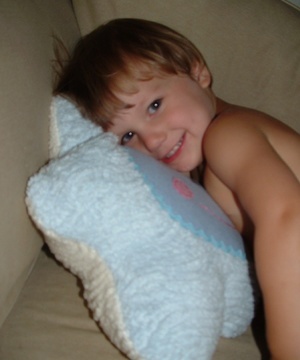 And here's Ez, happily "'nugglin'" with his new pillow. I didn't think I was going to share this news--that line of what's "too personal" for me is hard to distinguish since I feel so close to many of the people I know read this. But I'm opting for being "real" here, so bear with me as I share what is now very happy news for my family. Exactly a week ago today, Calvin complained of a neckache, which was followed by the sudden appearance of a large, hard mass on the side of his neck. With no other symptoms, and the size, shape and way in which it appeared, our doctor seemed as alarmed as we were. The concerns ran from mono (presented as our best case scenario--it was so odd to be wishing for mono!) to Leukemia. I will never, ever forget the feeling in my body as I heard that word in the doctors office, and how it stayed in my body as the days progressed and we waited, and waited, and waited some more for the testing and then the results. My first reaction was to research and research, which of course, was only terrifying, really, and leading me into a week of worrying and lots of anxiety. But something amazing happened for me this weekend, as I remembered some recent readings I'd done from Thich Nhat Hanh's Our Appointment With Life: Discourse on Living Happily in the Present Moment. In this book, he talks about the need to let go of both the past and the future in order to be fully present and open to the moment of now. As my thinking started to shift, I held on to the idea that "the future has not yet come"....and once I was able to do that to a degree, the present moments became so clear, vivid and beautiful to me. And with that, I was able to fully experience so many beautiful moments with Calvin this past week. Amazing, lovely, sweet and heartwarming moments. I can't tell you the relief and joy we felt when the results came back clearing him of everything (all he has is an acute virus, and a bump on his neck ;)). But I'm also feeling joy and gratefulness at the whole experience for what we've gained from it. Oh, so the artwork above. 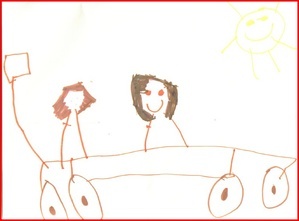 It's one of Calvin's recent drawings--he and Ezra on a wagon ride. 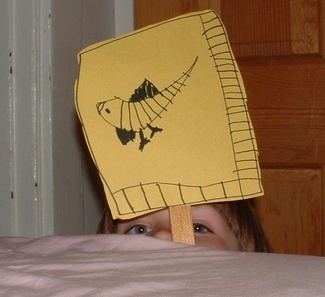 This weekend, I was drawn to this picture of his, and turning it into an embroidery project occupied much of my time. The repetitive, meditative process of the needle and thread going in and out of the fabric was so soothing and comforting to me, and helped me in my attempts at mindfulness. So, this new pillow happily resides on the center of our living room couch now where I can look at it often and hopefully be reminded of the beauty of each "present moment" I have with these little ones. 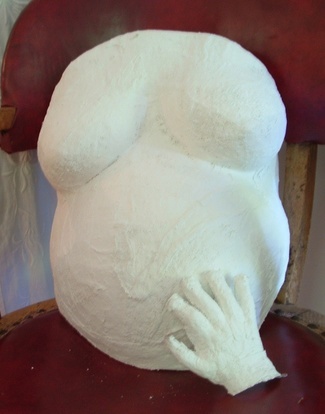 A cast of my belly, and Calvin's hand done just a few days ago (some tips here for anyone interested. we did it ourselves using plaster of paris strips from our local art store). My breasts aren't that big in real life--they can't be, can they? They're definitely not that lopsided. ;) So yeah, I'm still pregnant...and Steve just informed me that I've been pregnant for exactly 37.5% of the time that we've known each other. I don't really know what that means, but it seems like a lot, doesn't it? Self Portrait bloggers here (so many! ), and Flickr gallery here. First, some fabulous vintage costume jewelry for dress up play. And a brooch for mama. 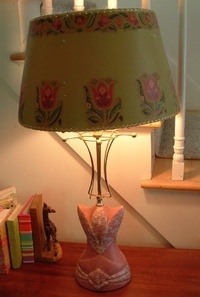 A way cool old lamp for my sewing table (so hard to photograph!). 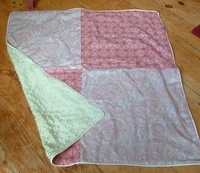 Sweet, sweet vintage cotton baby blanket. 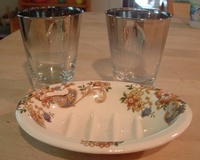 Glasses to match the set I already havem and an old soap dish. And the jackpot. A tin full of old, old buttons. Ah, that feels much better. Calvin's been a little under the weather lately, so I made this bag this weekend to bring him a smile. 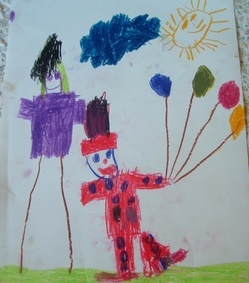 He was on a big clown-drawing kick a few months back, and I saved this drawing to do something with. 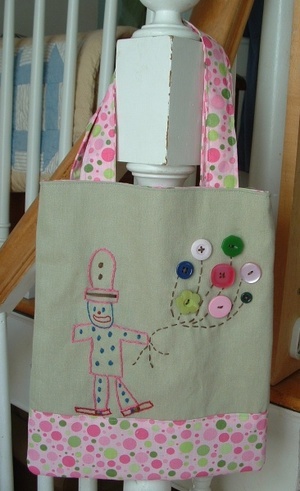 I embroidered his clown (with minor editorial adjustments, which I don't usually do), added some buttons for balloons, and turned it into a tote. So here's his new clown bag, for holding his favorite treasures. Right now it's holding his toilet paper roll collection (oh yes, it's a collection!). "Someone's going to lose an eye!" We have this nightly pillow fight ritual around here (yes, right before bed, and amazingly it WORKS in the opposite of the traditional advice of "don't get too wound up before bed"--instead it totally wears them out). But once in a while, it gets a bit rough and ends with someone getting hurt. One night this week, it was Papa. The self-proclaimed "Monster Ezra" bit him on the nose. Once the blood stopped gushing (seriously), he needed a bandaid. And then so did everyone else, of course. 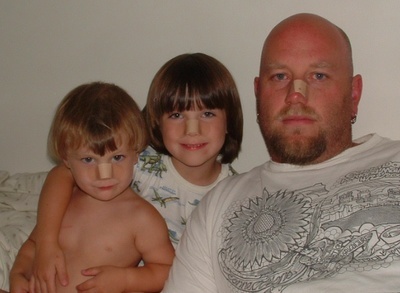 So here's the wounded, the culprit, and the sympathizer--all bandaged up. Look at Ezra's face! 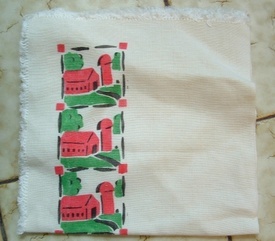 I love this set of 6 vintage napkins I found....with farms! I can't really explain this purchase. 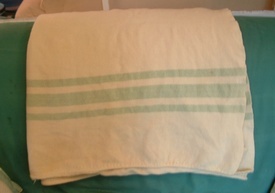 It's a set of "vintage" towels. Towels? Who buys used, old towels? What's wrong with me? BUT...Look at those COLORS! Amazing. AND, it's a SET for crying out loud. I mean, come on, help me out and tell me you'd do the same. And there was NO way I could leave this dress there, with $1 on the tag. 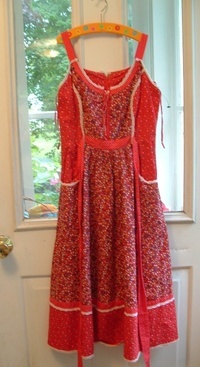 I SO remember wearing dresses like this when I was very young. I thought it would be perfect for the dress up costume rack. And mostly this one's exciting because it was only .99 cents. It's a very large wool blanket, with sage stripes. Yummy sage stripes. I cannot pass by stripes. 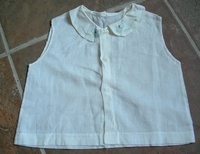 Other than that, I bought some vintage white pillowcases for embroidering, a few books, and some clothes for the kiddos. Man, the springtime rush of church rummage sales is looking like a LONG ways away right now! 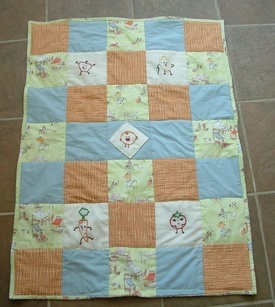 This is the lovely, sweet surprise that arrived in the mail for me (oops, I mean the baby) last week from Amy. I knew she had knit the booties from her posting them recently, but it was still a total surprise when they arrived--so beautifully packaged as is always the case with Amy--and surrounded by other fabulous goodies. 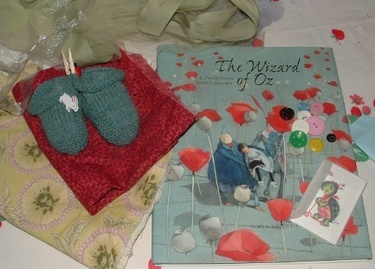 Most special is the Wizard Of Oz illustrated by Lizbeth Zwerger. Amy posted about her wonderful illustrations long ago and I've been wanting to add something to our collection since. Amy was so right on--the illustrations are AMAZING. I don't think the wee one will mind that we're reading it to big brother right now, who's loving it as much as Mama is. And just in case you didn't see them when she posted them, here are the sweet things up close. 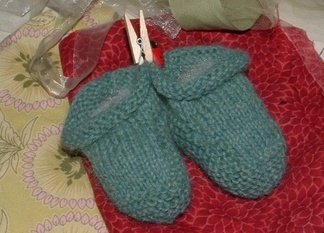 SOOO unbelievably soft and cozy--I can't wait to put them on baby toes this winter. Thank you, Amy!! Such sweetness. 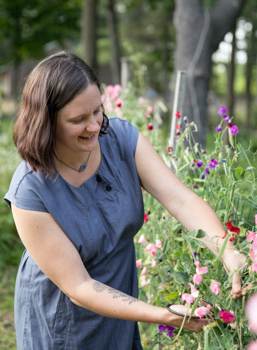 I continue to be amazed and blown away by the connections and relationships that this whole blogging community has created. My exchanges with Amy have been one of those rare, "real" relationships that I feel so blessed to have, despite being physically divided by a continent. Thank you, thank you, thank you. And then the love continues....yesterday, this wonderful package arrived in the mail for me from Amanda. Just from the mere mention of my regret for not joining the fabric swap, she ever-so-sweetly sent me a package of just that! 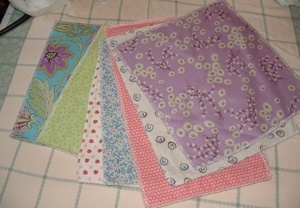 A huge loot of amazing fabric--so much fun stuff in here!! 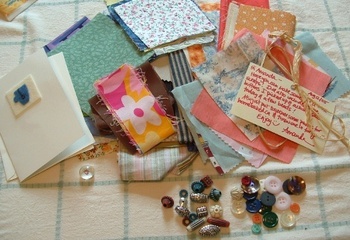 And some cool buttons and beads, and a fabulous card from her shop Homebaked. Thank you, Amanda!! And a Happy Belated Birthday to you, too! Yay! 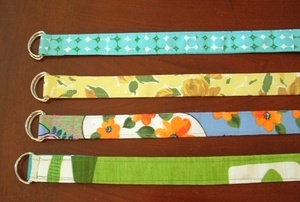 Last week, I finished my aprons for this month's Tie One On: Mini-Me theme. Here are the results - for the boys and Papa. 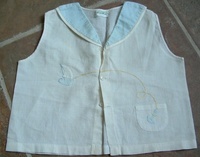 It started with the vintage ribbon on the bottom of the aprons, and some heavyweight grey cotton for the apron. 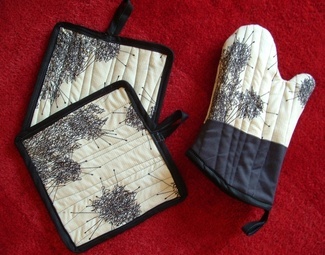 Calvin picked out the coordinating black and white dotted fabric for the pockets and ties. I'm bummed at the photos--somehow my camera setting got moved to the lowest resolution, so they're all grainy. 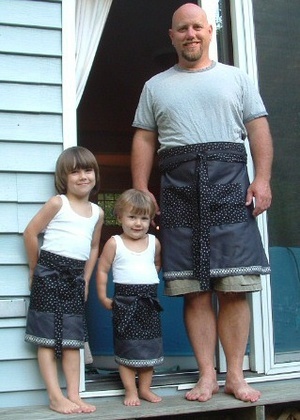 But the chances of getting them all in these aprons again and smiling are slim, so I've got to go with these for now! 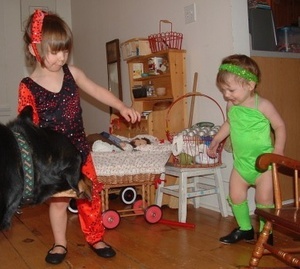 This was such a fun theme (I have a not-so-secret obsession with "matching" clothes for my kids--evil, I know). I can't wait to hear what Amy comes up with next! This is my self-lesson for the day in letting go of perfection. I had a clear idea of a shot I wanted with all three of my babes in it, and the pictures all came out kind of like this one--most of them even more unclear. But rather than try again to recreate a "moment", I'm sticking with this one and learning to like it. Next to toes and bums, my other favorite baby body part is the top of their heads. So here are my two sweet baby heads, and probably right about where they're kissing is a baby bum hiding behind the belly. 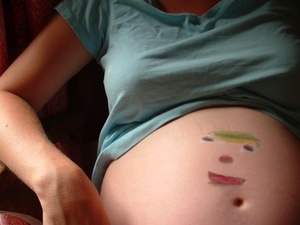 Wow, might this be my last "belly" Self Portrait Tuesday? As we're nearing the end, I'm having so many mixed feelings of excitement at meeting this new little one, combined with a little sadness about no longer being pregnant, particularly knowing that this will be the last one. As cliche as it is to say this--it really is just an amazing process to experience--each and every little kick feels like a miracle for the first time. And I love the way Calvin and Ezra interact with the belly babe-- Calvin telling the baby all about our family and patting my belly as he walks by me; and Ezra singing into my belly button and saying, "hello baby, baby" all the time, then laying his ear next to my belly button hoping for a response. Lately, he's taken to calling my belly a "watermelon" (which is fitting since my nightly obsession for banana splits has morphed into an insatiable desire for MORE and more watermelon). Anyway, I'm just feeling a little bittersweet about the transition from pregnancy to baby--wanting to hold on to and remember as much as I can about this part of it before the new life begins. Many more Self Portrait bloggers found here, with the Flickr gallery here. Look what arrived yesterday! Our rental birth tub. All set up and ready to go. Yesterday was our official "good to go for a homebirth" day. I swear our babe must have heard this too, because sure enough, we spent 4 hours last night with our midwife here trying to slow my constant contractions via every herbal, homeopathic and superstitious method we knew. Blessedly, something worked (I think it was the crampbark) and they went away. I'm only 35 weeks (full term pregnancy being 40), and it's oh-so-early for little lungs to be out in the world. I'd love to make it another week or so (Cal and Ez were both born at exactly 36 weeks), to get this babe a bit bigger and stronger, and me a bit more ready of course. This weekend will be full of more baby and homebirth preparations - getting piles of sheets and towels sterilized and piled up, baby clothes and diapers ready to go, and the house as near clean as I can manage, or rather--as clean as Steve can manage. Gotta love the "doctor's orders" of rest, rest rest. 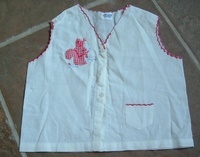 I loved finding a spot to use some of these favorite vintage buttons. So fun! Anyone who knows me would never use the word "thrifty" to describe me, unfortunately (Steve, stop laughing!). BUT...I swear it's in me somewhere deep, because there's this crazy thrill I get out of crafting things in a thrifty way. So today I present to you some examples of my recent thriftiness. Hee hee. 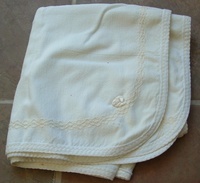 Super Thrify Example B: Burp Cloths. Yes, I know...very exciting...burp clothes. But seriously, who wants boring white diapers? I made these clothes with scrap pieces of fabric--a layer of flannel on one side, and cotton on the other, serged together. Atleast my baby will have something beautiful to spit up on. ...Ha ha! No, not the baby. 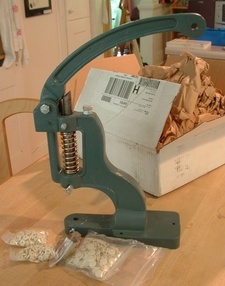 ;) My industrial snap press! Now, can anyone explain to me WHY I bought this industrial size snap press? Because for the life of me, I can't recall why I would "need" this, nor what the hell I'm going to do with it. A different take on Self Portrait Tuesday this week, inspired a bit by Amy's awesome gymnastics photo. 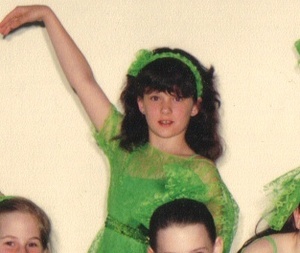 Here I am at dance class--maybe 7 or 8 years old? Check out that perm though--crazy, huh? 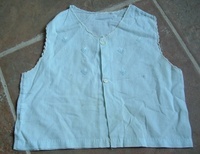 I had one every four months from the time I was 6 months old until I flat out refused at age 15. Gotta love the 80's, and having a hairdresser as a grandmother. Yikes. It's no wonder that in college I shaved my head for so long! Fast forward about 20 years, and here's my costume-loving son wearing the same outfit this past winter. And Ezra (and doggie Luka!) getting in on the action, too! 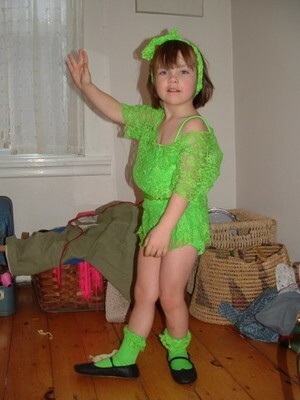 My mother saved ALL of my many, many dance costumes (Calvin's wearing another one in this pic), and my kids couldn't be happier with the bright colors and frilly suits from the 80's. Self Portrait Tuesday bloggers here, and Flickr Gallery here. 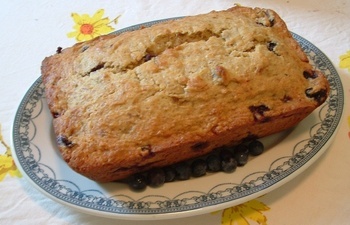 Banana Blueberry Bread - Yum! It's full-on blueberry season here in Maine, or atleast at the bushes in our backyard. We're thankfully having a wonderful crop of blueberries this year--I can't believe how much we've frozen already, plus all the pies and other treats we're eating each day. YUM!!! Mix dry ingredients in a large bowl. Mix second list of ingredients in a seperate bowl. Add wet to dry, stirring just until moist. Using a 8x4in loaf pan (coated with cooking spray), cook for one hour at 350 degrees, or until pick inserted in center comes out clean. Cool bread in pan for 10 minutes, then remove and cool completely on wire rack. Eat up. That's not true--I'm doing plenty of sitting, I swear (is my midwife reading this?). Really, it's only my hands that can't keep still. I don't know if all this energy is coming from being pregnant, or being near the end, or just plain fear--that once I have this third child my crafting days are over. 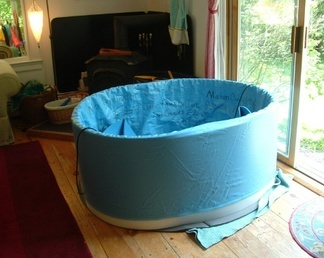 I'm thinking there's a damn good chance I'll be sewing well into labor--hell, maybe I should set up the birthing tub next to my sewing machine. 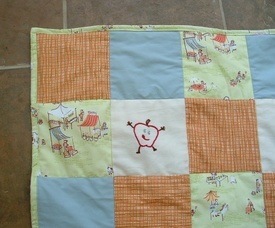 Whatever the reason for the energy, I'm getting lots of "little" projects completed lately. Like belts! Apparently, I'm thinking I'll have a waist to put these on sometime in the near future. 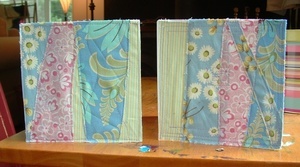 Such a fun project--some D-rings, fabric, and a bit of interfacing. I was on a total mass production line roll with these till I ran out of D-rings (need to search online for even bigger and more fun rings, JoAnn's had only small, boring ones). 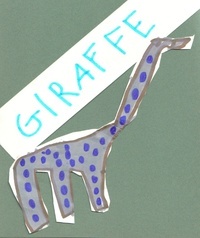 And, is there much more fun than crafting for little ones? 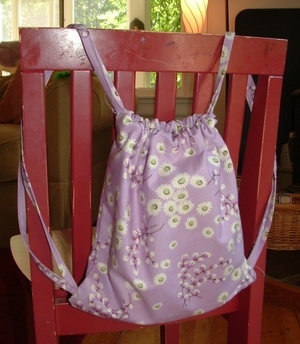 This mini drawstring backpack is for Calvin's friend who just turned six. I know these backpacks are so simple, but gosh, it took me a while to wrap my head around how it needed to be constructed. I filled it with "art on the go" supplies--markers, notebook, stickers, and a felt marker case. Now I want a bigger version for me. Hee hee. 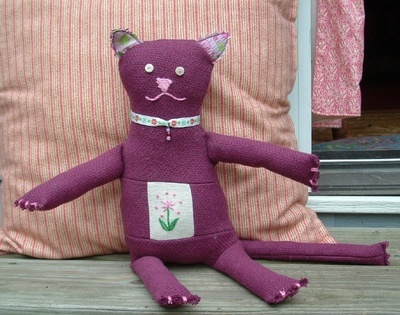 Meet Lucille....our new feline friend. 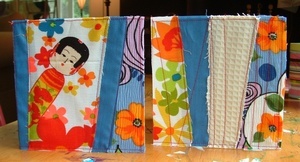 She worked her way into our home last night, based on The Many Faces of Steve pattern in the Denyse Schmidt Quilts book. I used embroidery on the belly panel, and her body is wool. Yikes! What am I doing? 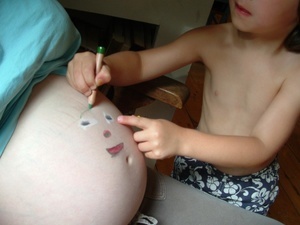 I'm about to have a baby and who knows what comes after (three children! ), and here I go signing up for Back Tack II! I really like the changes to this version--it provides much more control for freaks like me who need that sort of thing. Ha! Sign ups are opened a bit earlier than planned, and the list is filling up fast, so head on over and sign up!! (Love the new button, Alison!). 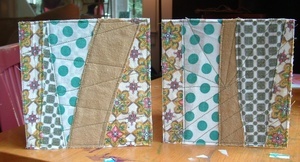 I'm totally obsessed with making these fabric cards, after the first one I made based on the pattern in the Denyse Schmidt Quilts book. It's such a simple process--really, just sewing scraps of fabric onto card stock, and then "quilting" the card with additional stitching. 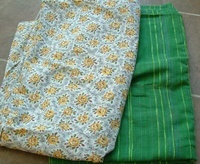 A rotary cutter is helpful for trimming the fabric and threads on the sides after sewing. There's so much freedom in putting the fabrics together. 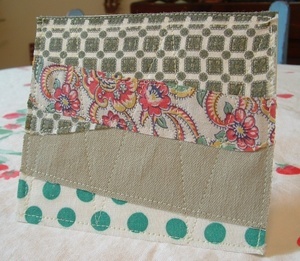 And paper-y in name only--if you haven't already, go check out Laurie's new shop - Mod Dots Shop. I love her pins--so adorable! Yup, squeezing my belly into every last Tuesday that I can (Who knows what I'll do when I have to think of myself as the subject matter, and not "the belly"...oy..scary). 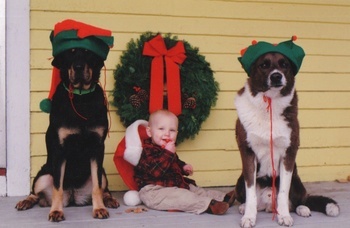 I know, it's getting obnoxiously baby focused around here. But I swear--the next three days there will be no mention of babies. I promise. Self Portrait bloggers found here, with the Flickr group here (which I have yet to join, because I'm a Flickr Slackr). After lots of steam in the beginning of the week with crafting, the end of the week has been the complete opposite--full of birthday celebrations, guests from out of town (and more coming! ), summer festivals, and general life stuff. While all of this is lovely, of course, I do find myself itching, craving and even dreaming about getting back into a project. 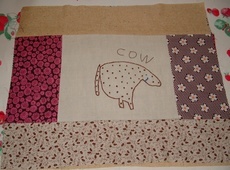 I know some of this is end-of-pregancy nesting, but the truth is, even without being pregnant, I NEED to "craft". Seriously People sometimes ask me how I find the time, and my honest answer is that I have no choice but to find the time--that crafting (creating)--in whatever form that may be (I'll avoid going into the whole long internal battle I have about whether my "craft" is art, and why should it really matter, yada yada) -- crafting IS my sanity. It's what keeps me going, brings peace and groundedness into my (not always peaceful) life. It's become my therapy (cheaper? hmnn, not so sure). 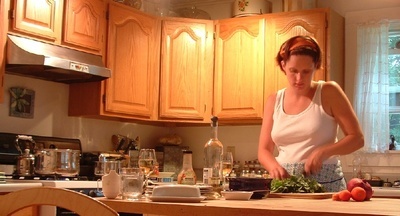 Without the time to create almost every day, I feel like something essential is missing--you know, like "me" gets lost in the shuffle of daily life at home with young children, and all of the many, many things that job encompasses--phsically, spiritually, emotionally and intellectually. 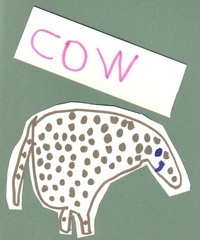 Okay, now I think I'm making no sense, and starting to feel a bit vulnerable (man, blogging can be so weird! )...so how about if I stop rambling and just show you what I *have* been doing the past few days? Here's the blueberry pie we made for Papa's birthday this week, after some serious drooling looking at both Amy and Stephanie's creations. 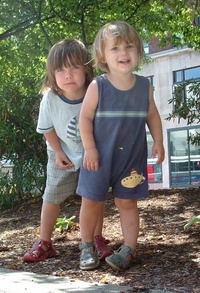 I love Ezra's face in this picture! He could barely keep his hands off it (and only did because it was piping hot). 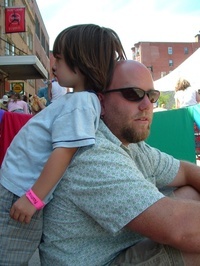 Papa and Calvin at the Festival of Cultural Exchange. 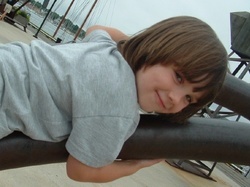 And this is Calvin, seriously thinking about pushing his little brother off the edge of the landing they were on (He's in another phase in their relationship where he's asking to sell Ezra on Ebay. Seriously). Updated to add: I'm digging Amy's words today. It has something to do with what I was trying to say, I think...gosh, sometimes I wish we were all in the same room together *talking* about all of this! How lovely would that be? Apparently, I'm deep in nesting mode, because even when I'm not crafting for baby, it's still pretty darn domestic in theme. 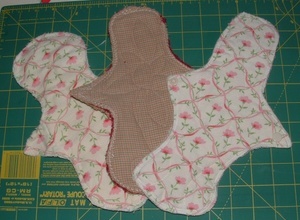 Hence, potholders. On Wednesday, Steve took the boys to the beach and I had a whole day to myself to sleep (mostly) and craft (a little). I've been anxious to try out something from the new Denise Schmidt Quilts book, and the Too Hot to Handle Mitts seemed like a good, mellow start. 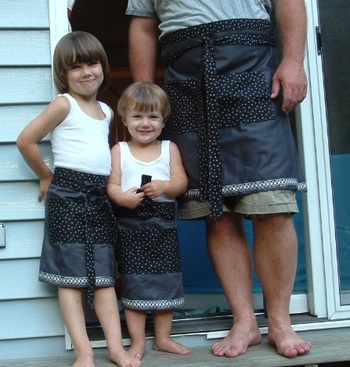 I've been itching to use this vintage black and white fabric for a while, and this was the perfect project, I'm thinkin'. Of course, when I was done, I needed to make a few square potholders to match, because really, you need a *set* of something to make it really cool, right? 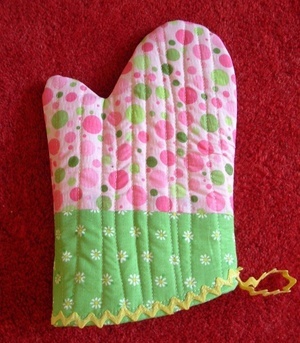 And, the mitt in pink. 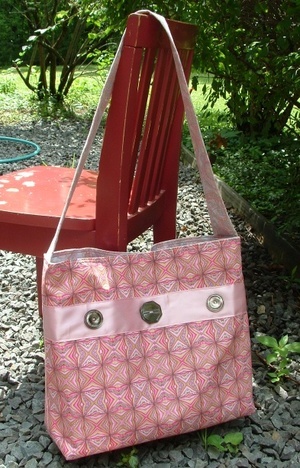 This is a really fun, simple pattern. 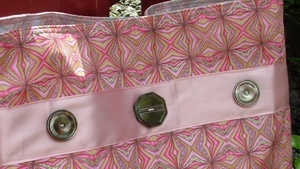 Though, a word of advice if anyone is thinking about doing it--I'd recommend doubling the batting, and I swear there's a typo on the pattern page (email me if you want more info). 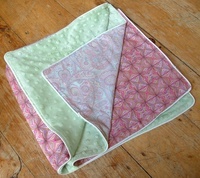 And here's the fabric birthday card I made for Steve, inspired by the Dis-carded "pattern" in the same book. 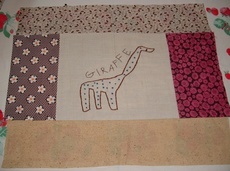 This was just WAY too much fun to do, so quick, and such fun to use little scraps (these are mostly vintage feedsack scraps). I can't wait to have a few moments to do some more. 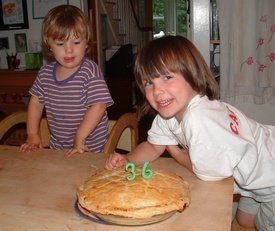 Happy 36th Birthday, Steve!! (Yes, I will take every opportunity I have to repeat your age--what is it again, 36? Hee hee). 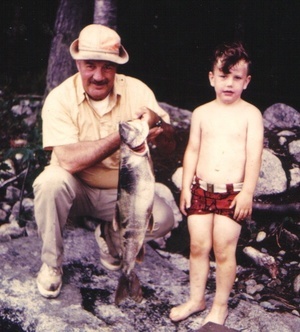 I love this picture of him as a little boy with his grampie--look at those shorts! look at that fish! Look at that hair! So, so adorable, just like you are today. I wish you a birthday full of joy and love from your boys, and if all the babysitting stars are aligned tonight (oh, please! )...perhaps even a date with wifey! Self Portrait Tuesday bloggers found here. And a new Flickr Gallery, too, thanks to Joy. 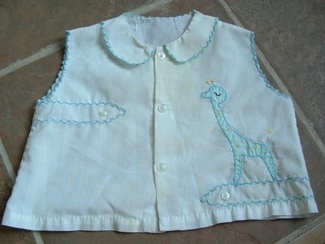 I decided to tackle the most challenging thing on the "baby crafting list" last night. 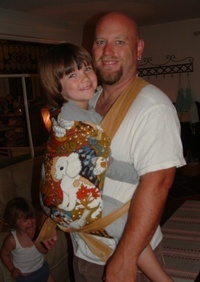 This Mei Tai (a traditional Asian style) carrier was surely it, given that I had no pattern to go by and did a lot of guessing. I'm very pleased with the result though! I know it looks like a simple piece of fabric with ties on the end, but wow, it felt a lot more complicated than that. 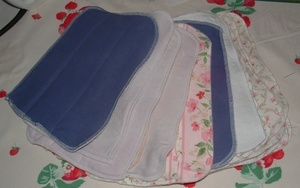 The whole body piece is padded (cotton quilt batting), and the straps are padded as well. 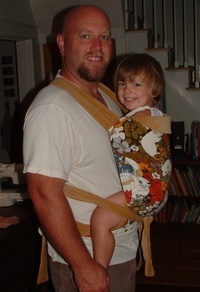 It was a bit tricky to figure out how to get the straps sturdy and strong enough to actually hold a baby (or child, as you'll see in a second!). I'm not sure I could ever remember how to do it again (nor want to! 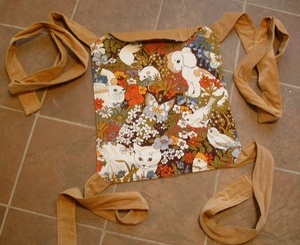 ), which is a bummer, 'cause wouldn't it be cool to have this in a bunch of fun fabrics? Here it is in trial action this morning (forgive the quality--it's a dreary day here with little batteries left in the camera!). 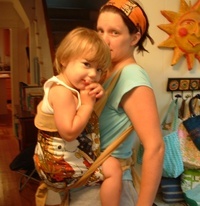 It seems like with each babe, I've had a carrier that I was really attached to--with Calvin it was the New Native Carrier, and with Ez, it was the Maya Wrap. 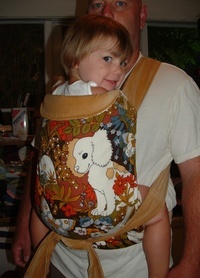 Perhaps this is the one for baby #3! Yes, I'm wearing that over my belly--he's kind of on the side like a hip carry. In the last picture you can see Calvin who insisted on trying it out too (and look at sad Ez in the background that his turn is over!). 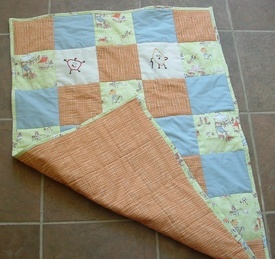 I wasn't exactly thinking 45 pound child when I sewed my seams, so let's hope they're strong!